A screwdriver is a popular alcoholic highball drink made with orange juice and vodka. While the basic drink is simply the two ingredients, there are many variations. Many of the variations have different names in different parts of the world. The International Bartenders Association has designated this cocktail as an IBA Official Cocktail. 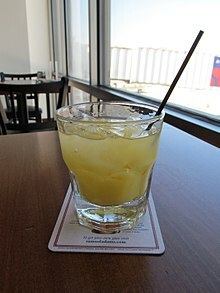 The screwdriver is mentioned in 1944: "A Screwdriver—a drink compounded of vodka and orange juice and supposedly invented by interned American fliers"; and in 1949: "the latest Yankee concoction of vodka and orange juice, called a 'screwdriver'". A screwdriver with two parts of Sloe gin, and filled with orange juice is a "Slow (Sloe) Screw". A screwdriver with two parts of Sloe gin, one part of Southern Comfort and filled with orange juice is a "Slow Comfortable Screw". A screwdriver with one part of Sloe gin, one part of Southern Comfort, one part Galliano and filled with orange juice is a "Slow Comfortable Screw Up Against The Wall". A screwdriver with one part of Sloe gin, one part of Southern Comfort, one part Galliano, one part tequila and filled with orange juice is a "Slow Comfortable Screw Up Against The Wall Mexican Style". A screwdriver with one part of Sloe gin, one part of Southern Comfort, one part Galliano, one part peach schnapps, and filled with orange juice is a "Slow Comfortable Screw Up Against a Fuzzy Wall". A screwdriver with one part of Sloe gin, one part of Southern Comfort, one part Galliano, one part peach schnapps, one part sparkling rosé, and filled with orange juice is a "Slow Comfortable Screw Up Against a Fuzzy Pink Wall". A screwdriver with two parts vodka, four parts orange juice, and one part Galliano is a Harvey Wallbanger. A screwdriver with equal parts vanilla vodka and Blue Curaçao topped with lemon-lime soda is a "Sonic Screwdriver". A shot of vodka with a slice of orange is a Cordless Screwdriver. ^ "TURKEY: Wild West of the Middle East". Time. 24 October 1949. Retrieved 24 July 2012. ^ Ray Foley, X-Rated Drinks: More Than 250 of the Hottest Drinks Ever Made, Bartender Magazine, p. 153. ^ Ray Foley, X-Rated Drinks: More Than 250 of the Hottest Drinks Ever Made, Bartender Magazine, p. 155. ^ Hutchinson, Dan; et al. "Slow Comfortable Screw Up Against The Wall Mexican Style #1". Bar None Drinks. Retrieved 2 April 2018. ^ "Sonic Screwdriver recipe". Retrieved 24 July 2012.